Global Directions/Things Asian Press, 9781934159149, 293pp. Joined by her sister and best Vietnamese girlfriend, Kim set off to taste as much as possible while exploring rituals and traditions, street cafes and haute cuisine, famine and feast, and Communism and the legacy of war. Together, the three women discovered a society shaped by its ever-changing relationship with food. Every encounter serves up an enticing morsel, from uncovering the secret world of ragu in the French hill town of Dalat to bonding with the Julia Child of Vietnam in Saigon. Epicures and culture buffs will delight in markets, restaurants, farms, fisheries, and cooking classes as Kim assembles her dream meal and shares recipes such as banana flower salad and clay pot fish. Examining how we eat reflects who we are as individuals and as communities, Communion: A Culinary Journey Through Vietnam offers a feast for armchair gourmets, as well as a colorful guide for travelers hungering for their next adventure. Kim Fay Pacific Northwest native Kim Fay first traveled to Southeast Asia in 1991. She spent four years living in Vietnam and has traveled back frequently, writing about the region. As an expert on travel literature and Vietnam, she has been a guest speaker on NPR and has written for numerous publications, including Travel + Leisure. She is the creator and series editor of the To Asia With Love guidebooks. Shelives in Los Angeles. 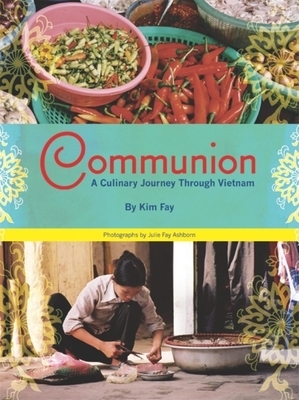 Julie Fay Ashborn Julie Fay Ashborn s travels through Southeast Asia inspired her photography in To Asia With Love, To Vietnam With Love, and The Little Saigon Cookbook. She was raised in the Pacific Northwest and now lives in Los Angeles with her husband Clive, daughter Charlie, and son Oliver. "